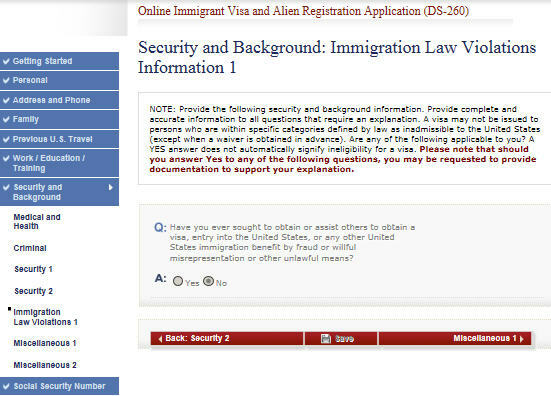 OK – so the main task to process your DV lottery win is to complete a form online that is your “application” for immigration benefit. That form is the DS260. The form itself might seem daunting, and it may take about 2 hours to complete. It is important that you prepare your information, and enter the details as accurately as possible. You will be able to make changes later on, but it makes sense to spend a few extra minutes early on to get this right. Passport information for you and your family members. Birth certificates for you and your family members. An address in the USA of a friend or family member. This is where your Green Card will be sent. Enter the form for the first time. The form will expect your date of birth in day/month/year order. This is odd because Americans write date in month/day/year order. Once in the form you will go through a number of sections where you will enter your details. 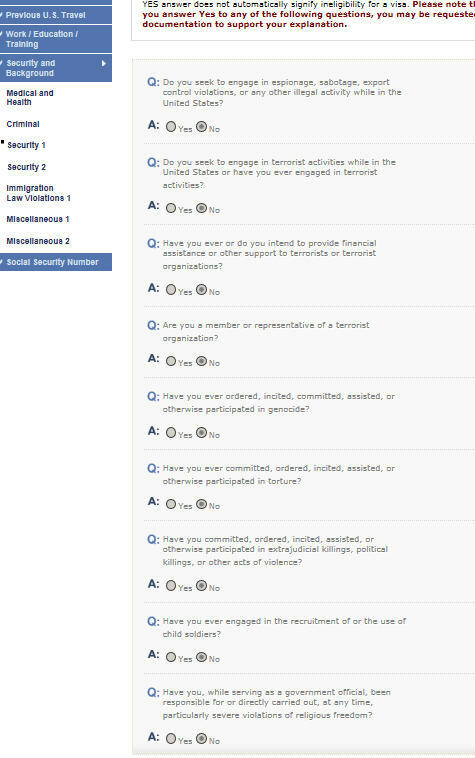 Most of the information is self explanatory – but here are screenshots for each section of how the forms will look for a simple case – and some comments about some of the questions. Please remember it is important to make sure your answers are YOUR answers. Don’t just copy what I am suggesting if the answer does not agree with your circumstances. Here you will see a list of applicants attached to the case (based on the eDV entry). Click the link under “IV application” to complete the details for each applicant. You can also add applicants from this page (if you have married since the original entry or had a child). 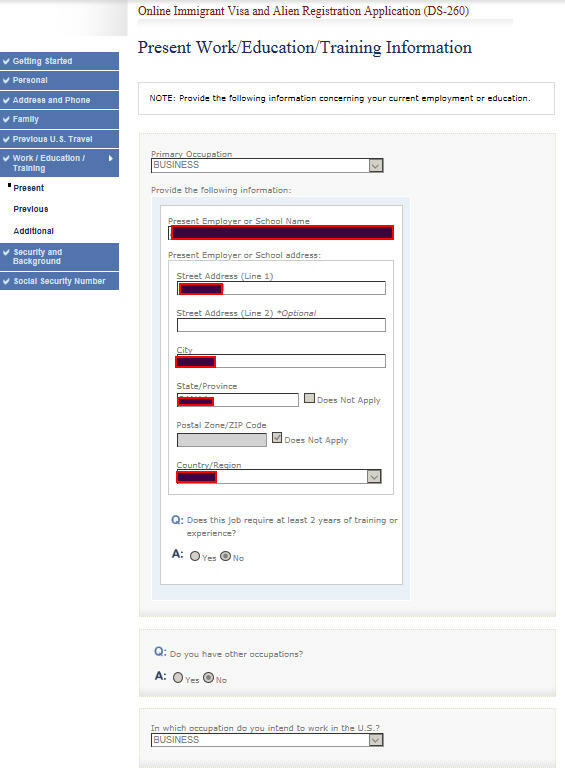 Once you have added an applicant you cannot remove that applicant or change their name. So – please be careful about name spelling etc. It is also important to note that if you are adding a spouse or child that you already had prior to the original eDV entry but failed to mention in the original entry you will most probably be disqualified, as that is a critical error. If you do have to add a child or spouse because of a birth or marriage while you are waiting to be interviewed, remember you will need to add an applicant AND in addition your own form will need to be unlocked so that you can add the new family relationship to your form. This is where you will enter your name information. It is a useful page to capture your name in English, but also in Native alphabet. The names entered on this page should be as listed on your passport – but also use the “other names used” section to make sure you have covered combinations that appear in your documents. For example, if you have an education certificate that includes an additional family name, use the alias section to include that name. Also, use the alias section if you entered your name differently on the eDV entry. 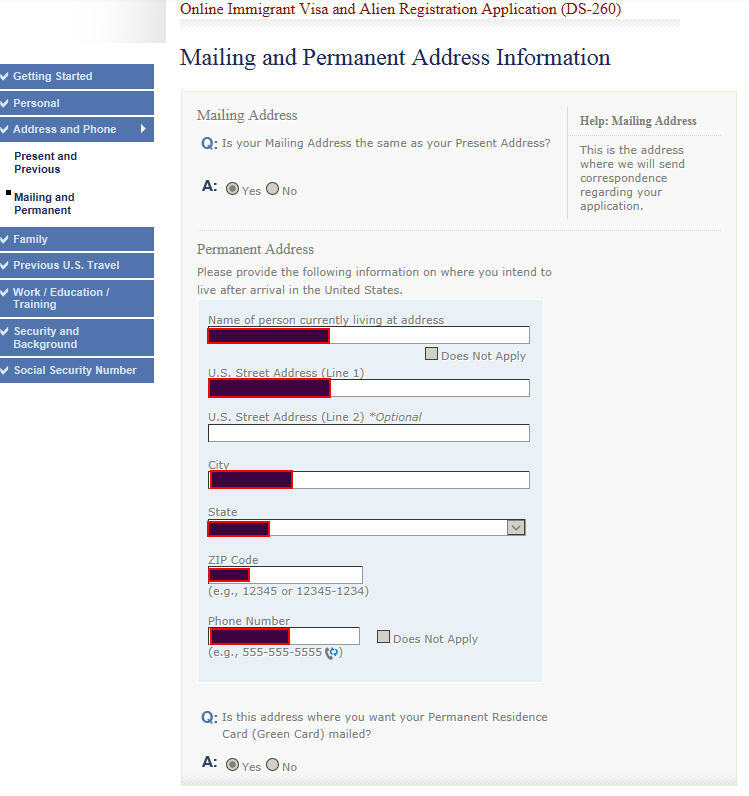 Entering your other names used here means USCIS have early notice to perform name checks on your various names used and therefore you can make sure your background check is comprehensive – which is exactly what you want to reduce the chances of being placed on AP or even refused for incomplete name information. Complete the other details such as date of birth. If you somehow made a mistake on the eDV about your date of birth (for example during conversion from a different calendar) THIS is your opportunity to correct that mistake – please pay attention to that. This would normally agree with the date of birth on your birth certificate, but if that is not known, then use the date shown on your passport. About city/state/country of birth. ON the eDV entry (where you entered the lottery) you will have entered something for your city of birth. The three levels are related to each other – so a CITY is sometimes denoted as being in a STATE (or province) and that STATE is within a COUNTRY. People sometimes are not sure what to enter so let me gives some examples. Your passport should be valid for 6 months beyond the point of entry, but if your passport will expire during the DV process, you might be better submitting now with the current passport and updating later once you have the replacement passport. This is especially true if you have a low case number, and are therefore expecting an early interview. If you do need to renew your passport during the DV process, in many cases people have taken old and new passports to the interview without unlocking the form, but the preference would be to add the new passport details if time allows. OK – hope that makes sense. Check what it says on your birth certificate. It is important that this information agrees to the birth certificate and the passport. 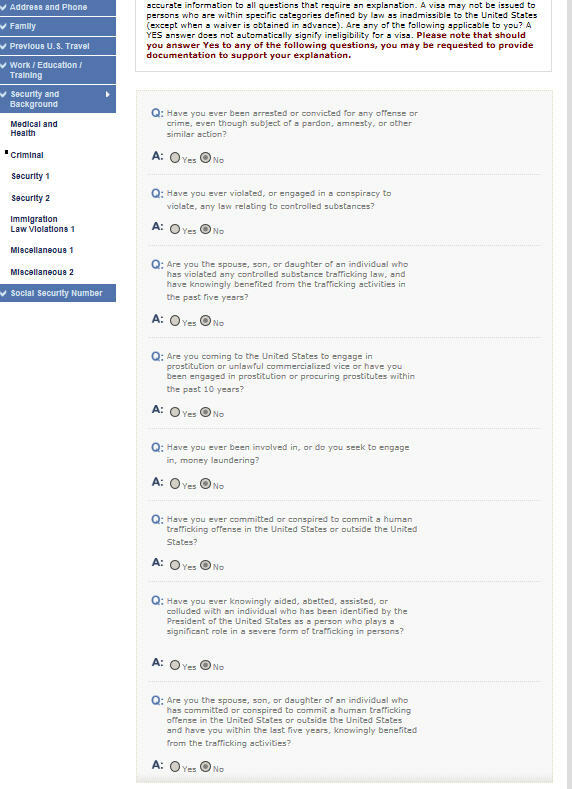 By the way – your country of birth may not be the same as your nationality (which is on the next page). But your country of birth is what should have driven your entry into the lottery (eligibility is based on your country of birth, NOT your nationality). 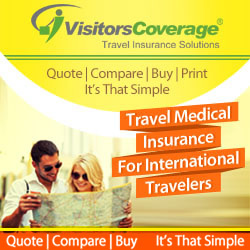 This page is about your travel documents (passport). Make sure you have the passport in front of you when you complete this page – accuracy is important as this will enable background checks. Note, if you do not have a passport at this time you can complete the entry using another state issued ID, and then later unlock your forms to add the passport details. You WILL need a passport prior to interview as will any derivative (family member) of yours. Try and complete this as accurately as possible. Provide all the address that you have LIVED at since the age of 16. If you stayed at a holiday home for a month or two, that does not need to be entered, but if you LIVED at an address for a few months then you should enter that address. You enter past address in reverse date order – meaning going backwards in time, one address at a time. Be as accurate as possible with the date you started living at each address (you can guess the dates within a month or two). This is information about where you expect to stay in the USA OR the address of someone you can trust to receive your Green Card on your behalf. Most people can think of someone within their family or friends that could receive the GC for them. You should also know that you can change this address during the process – right up to the day your arrive in the USA for the first time. OK – self explanatory information. 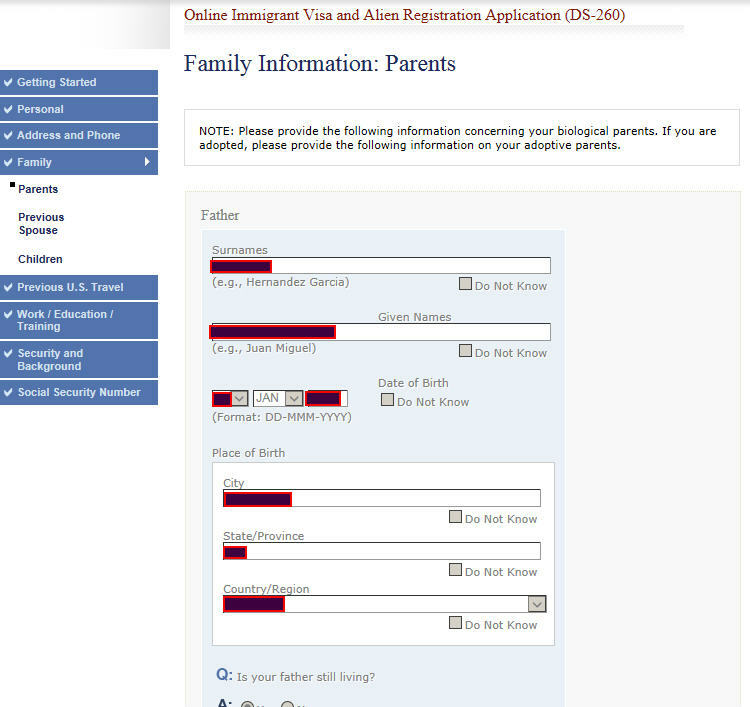 I only show the top of the page in the screenshot below but you add your parents details and their addresses. THe data here should be accurate, but if you don’t know their birthdates etc. it is not a huge problem. Do the best you can. Enter the details as appropriate to your case. Remember, the information should be correct on the day you enter it. So, if you plan to marry in a month but want to submit your form today then you are SINGLE today. YOu can either delay submission of your form until you are married, or submit now as single and unlock your form later after the marriage. There is some information about marriage during the DV process here. A previous spouse is entered when you divorced of a spouse passed away. You will be required to produce a divorce certificate or death certificate during the interview to tally with what you enter here. Fairly obviously you will need to enter information about each child you have, making sure their information ties with birth certificates and passports. If your child is nearly 21 there may be special considerations for you. Please read this article on children aging out and their status under the CSPA. If you are expecting a child to be born during the DV lottery processing period there are also procedures in place to obtain a Green Card for that child. I will address that with a new article. One thing I would say, it is ESSENTIAL that you listed all your children in the eDV according to the instructions. If you made a mistake about that you may have caused yourself a problem. If you have a concern, contact me and explain your situation. 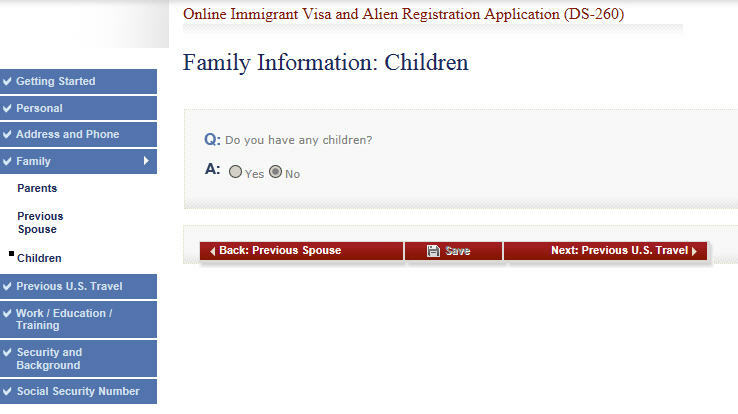 In the case shown in the screenshot below the applicant did not have any children. OK so this is important as education OR work experience are requirements of the DV lottery. Please read this article for more information about meeting the requirement. I cannot stress enough. You are only required to meet the education OR work experience – you do not have to prove BOTH. Of the two routes, education is the simplest and most reliable method, but some people cannot meet the education requirement – and although this may surprise you that includes me. 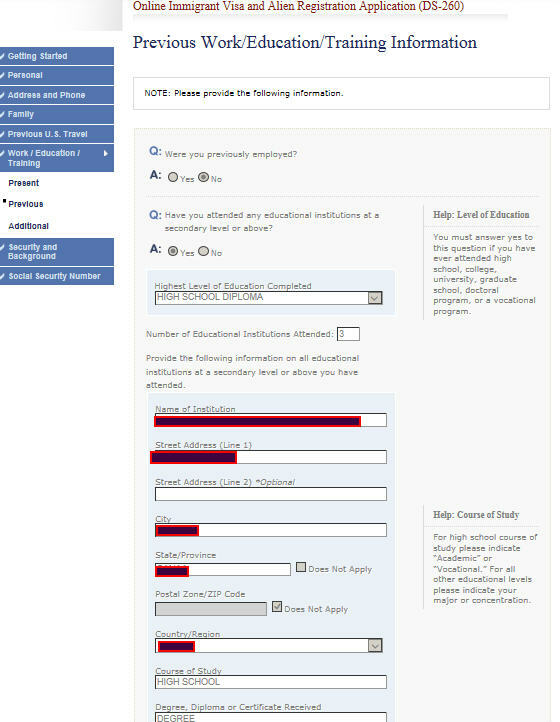 I have had a very successful career in the IT field and have demonstrated my skills to earn a H1 visa (which is category of visa for highly educated or highly skilled workers), BUT I could not have met the DV lottery requirement on education! So – think carefully whether you do or not – and act accordingly. Enter the information about work and education based on what you are doing at present. If you are entering work experience and hope to qualify through work experience you should consider carefully the question about “does this job require 2 years of training or experience”. Again, read the article above to understand that better. OK – so this will vary depending on what you did before your present occupation. Maybe you had a different job, maybe you studied. Whichever is true you must enter that information here and create a complete history of your work, education and training. Try and get the dates to be accurate and make sure that those dates make sense with the address information you gave previously. This page can end up being quite long and for the screenshots I have had to break it into two pieces. Just take your time and make it make sense. You can add another occupation (work or edication). Again, you enter going “backwards” in time. Answer the questions truthfully on this page. If you answer Yes and a box opens for further details there will be instructions of what further detail they want. Answer these questions carefully and truthfully. The second question (about vaccinations) causes some debate. Truthfully it WILL NOT MATER whether you choose Yes or NO for that particular question. The right answer for 99% of people is NO, because you do not have “documentation to establish…”, even if you do have records of vaccinations. So, it is a subtle point but whether you answer yes or no it will not mater. The vaccinations you actually need will be decided by the panel physician at the time of your medical. So by all means gather whatever vaccination documentation you have. Answer these questions truthfully. Most criminal convictions will not cause disqualification, and you will have a chance to explain at the interview. The crimes that can cause disqualification are called “crimes of moral turpitude”. It is a vague term and perhaps one that I will write about to clarify but most people by far will not have a problem even if they have a criminal conviction. Previous immigration fraud is not surprisingly one of the crimes that can cause an issue which is why it is essential you always tell the truth on these applications. Again – answer these truthfully. Again – answer the questions truthfully. 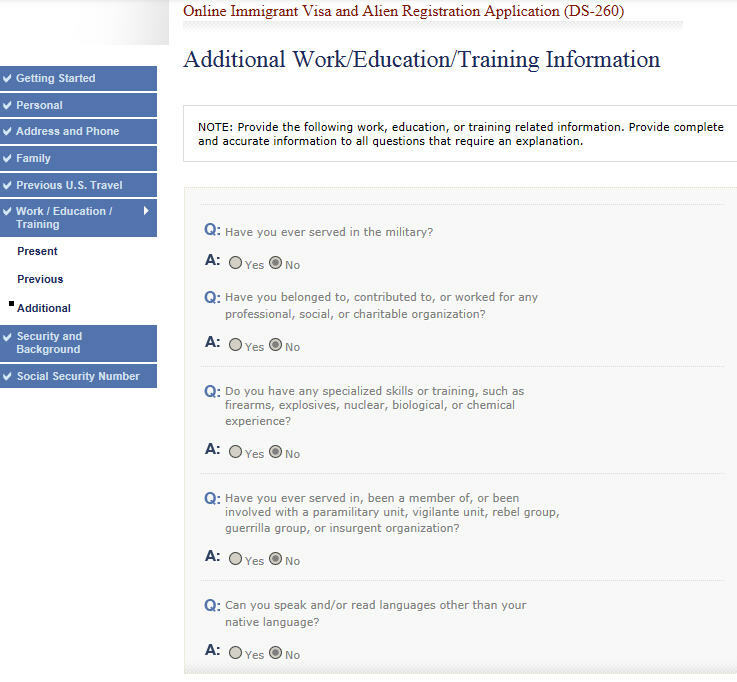 As I mentioned earlier – they take immigration law violations seriously! The skilled or unskilled labor question has sparked some debate. In reality if you intend to work in the USA then the answer to this is Yes – but this is another question that will not cause a problem no matter which response your choose. Again these just need truthful answers. The healthcare professional one is another question that really doesn’t matter how you answer it. If you are a healthcare worker don’t be afraid to admit that. The public charge question should be answered NO. Public charge means financial assistance from the government. You must realize that the Green Card lottery winners should not be claiming “public assistance”. There are some exceptions to that statement, but in general you are expected to support yourself. The USA is a land of opportunity, not free gifts. 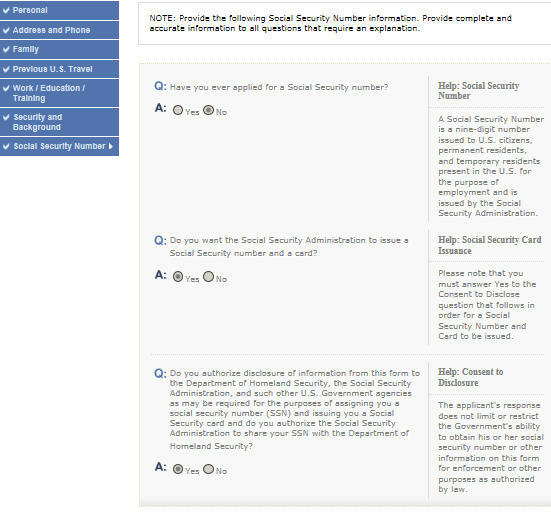 Answer these three questions as shown below unless you already have a SSN from a previous period in the USA. USCIS will (in theory) forward your details to the social security administration (SSA) to apply for your SSN. In practice many people find this does not happen correctly and delays are caused in getting the SSN after you enter the USA. Since the SSN is so important for many purposes here in the USA that is a nuisance, so I always suggest people visit the SSA office after a couple of weeks to make sure your SSN is “in the system”. You should receive the SSN card itself about 2 to 3 weeks after entering the USA. OK so you have completed your form. You do the same for each derivative (family member). Check all the forms carefully, take screenshots if you like and when you are ready, submit the form. You should then print the confirmation page. You will be able to review the form later in review mode and can also take screenshots at that point. You may also be prompted to fill out a form for “selected service”. 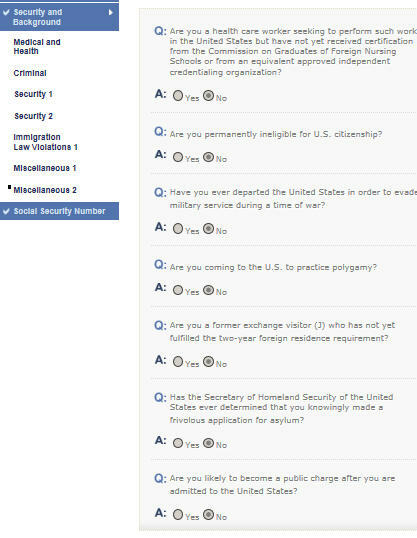 Any us resident male under 26 years old is required to register for selective service. This does not not mean you will need to serve in the military, but if there was some crisis that required additional military men under 26 years old will be picked by a lottery to be inducted into the military. The form will become “locked” so that you will not be able to edit it although you will be able to review the information after you submitted it. If you need at any time prior to your interview to unlock the form you can do so by emailing KCC who generally respond within a few days. Once unlocked you can make changes. Once KCC have your form they will “process” it. 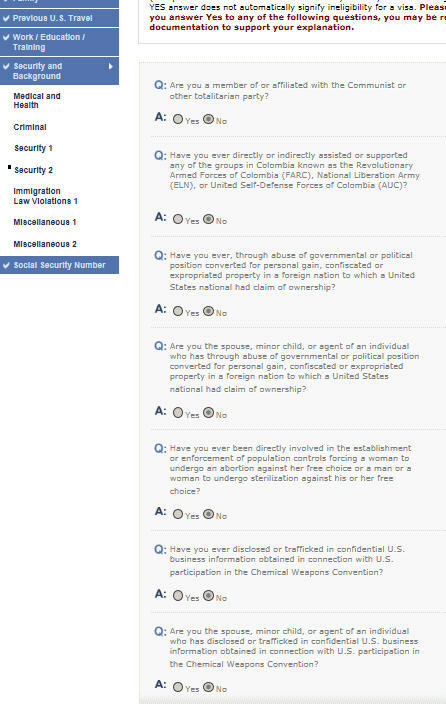 They conduct background checks based on the information you have told them and access to official records. The processing period in DV2015 took around 4 to 5 months because of the volume of forms submitted around the same time. So, if you have a very low case number and you delay the submission of your DS260 there is a chance you could delay the interview date – BUT don’t worry, you will simply be interviewed later. Interviews are conducted based on case number order but only from a pool of cases that have completed their DS260 processing. It meant that people with case numbers above 39500 could not get an interview. I am a DV 2019 selectee when playing the lottery i made an error on my daughter birth date even though she is not immigrating with me to the US .i did not completed her ds 260 because she is not going with me .Will it cause me a problèmes during the interview ? You are scheduled to come to the US Embassy, Consular Section on October 10, 2018 at 02:00pm to have in person prescreening. Only you (the primary applicant) is required to appear in person before a consular officer. This is NOT a visa interview and there is NO fee required. The strong preference is for you to appear with the same passport you apply for the DV. 1. What does prescreening mean? They just want to see you and maybe ask you a question or two. It’s nothing. I have the same problem like you. Hello brit I am a dv2019 selectee when playing I made an error on my daughter picture I submitted a wrong picture for her. It is only when I already submitted my dv entry that I notice that I have put someone else picture on her name and that was the only error I made. I have already completed my ds260 but I didn’t completed a ds260 for her because she is not immigrating with me .My question is will it cause me a problem during the interview ? Hello BritSimon, when I registered my eDV I copied for “spouse city of birth” from the “place of birth” in her passport. I found out the passport “place of birth” is actually a province, and the province-capital is of the same name. Her birth certificate mentions only subdistrict, district, province and country (no city). I thought the district was part of the province-capital since they touch on the map, but have different names. Now I learn the district might be a town in it’s own right (ie. City of Westminster & City of London under London province). Is it OK to correct “city of birth” on my DS 260 under spouse details (showing the district, not the province-capital)? Dear Brit , Your FAQs help us a lot in making to complete the things. There are some confusions also. As my wife is a principle applicant and she did not do any job she is housewife and i have selected homemaker as her primary occupation is it rite as a house wife. As selection is mandatory can we select not employed or homemaker? secondly she selected the occupation of education to work in USA.moreover she was not previously employed. she has master degree in finance. one more thing our native language is Urdu and we can not write in urdu there so i selected does not apply as technology is not available. Thirdly what we have to answer for the question of :Do u have documentation to establish that you have received the vaccination according to US law? as we do not have for the whole family according to us law but vaccination cards are available for children only and its from Pakistan , If we select NO the box comes need to be explain what we should write there???? 1. Just choose something. It’s a triviality. Hi, I am an accountant and the the primary occupation is not coming in the list of occupations in DS 260 what i have to do , whether to select from other and write an ACCOUNTANT because there is limited occupation there and no occupation related to FINANCE. same is the case under the occupation where you want to work in USA? Hope u will help me brit. Just pick something. It makes no difference. I made a mistake with date of attendance from and date of attendance to under education, but the documents I have (Degree and transcript)doesn’t show any exact days, Can I leave it like that or it’s better to unlock and change it ? 1. Does that ” with in ten days’ mean I need to check my DS-activation email every day or I need to check accessing the form itself with my case#? ( If you have some trends of others mail)- I know it sounds silly this question. 2. Why it become unavailable once it is active and confirm physically that was already me who tried so many times? The reason why I am asking this question( #1) is that because they said the reason for my DS-260 not available is that I tried to open it somany times or with computers of different IPs or combination of the two. Just relax and once it is open they will email you. Checking won’t break anything. You cannot submit the DS260 without clicking the link to read about your obligations to register for selective service. The DS260 LITERALLY won’t allow submission unless you click the link. You obviously just ignored the information! You need to register within 30 days of arrival. Not doing so carries heavy penalties and can cause problems in obtaining citizenship. Hi Brit…1.what about if a person has already Chosen to join the United States Army as intended occupation, does it matter to check that link again or not? 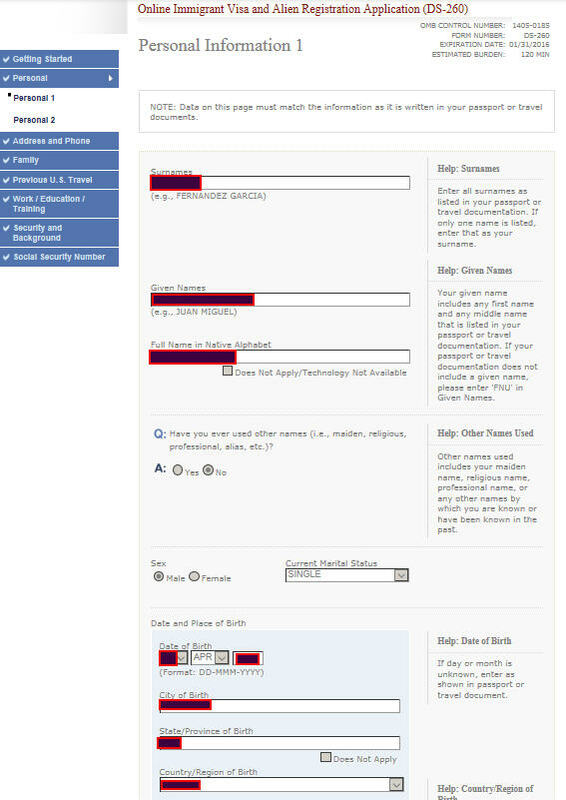 2 Can this failure to sign up for selected service affect a person of getting approval during the interview? 3.Some of us are beyond the age required or limit, is it a must for all during submission of DS260? 1. The person must still register. 2. No, because it is done later. 3. sss.gov has the details. Can a man be a derivative under his two wives.. When applying for dv lottery? Dear Brit, I would like to check if we do not have any one in the United State, what address we should be using ? Thank you ! You have to provide an address of somewhere in the USA that can receive your GC. So – find someone you can trust. Is there a date submission limit to complete the DS160 if selected for GC2019…im in the 900’s for OC and havent submitted it all as yet? No limit, but I suggest no later than May. I have completed the DS-260 for DV2019, but I’m still serving in the military and I’ll finish it on next March, so can I submit my documents to KCC at the end of March or there will be a problem if I delay to send the documents via email ? You can delay to then with no problem, although don’t forget the interviews are arranged ahead of time so April interviews are scheduled in February. I have a question. I am just filling in my DS260 and I am not sure how much information I should write about my 1 year compulsory military service because I served at 3 different military units, I was appointed to 3 different occupations/positions and also my rank changed twice. Do you think it is going to be sufficient if I mention only the last military unit, occupation and rank? I will have to email them a copy of my military service book anyway so why should I mention everything? Just the last position is fine. 1- Is a newly born child in need of a passport? 2- Do I have to fill out another form for him? 3- Normally on the statistics my number must be current for March. If I send my ds260 before January, could I have an interviewer for Mars? I have submitted DS260 in August 2018 for DV2019. I have not received any confirmation for the DS260 up to now. 1. Around when Can I expect a confirmation? 2. November Visa Bulletin, for Asia 1,600 + Iran 1,550 + Nepal 1,100. Thats means 4,250 number utilised in Oct & Nov? That emans approx. 2,200 from Asia per month? That means AS15XXX will come in March Or April 2019? 1. Yours is a very high number so you will wait until the final months of the process. 2. No that is not correct. The numbers for Iran and Nepal are WITHIN the range for AS as a whole. So for Nov 1600+1550+1100=4250. So ASIA number is 4250. right? that emans from WHOLE ASIA 2200 applicants will get interviewed. So as my number 15XXX, that means I will be in interview approx on the 7th month (which is April)? I already said, very clearly – NO your understanding is not correct. the 1550 and 1100 are WITHIN the 1600 range for Asia as a whole. Your Ref Number is very high. There for I think you should wait. I am also Sri Lankan applicant. Please contact me. According my case number(2019AS76**), I hope my interview will be held on 2019 of May. But my problem is, At the beginning of the 2019, I must start my university research and I must complete that research before end of the 2019. If my interview was held on 2019 of May, how long could I stay in my country after facing the interview? Up to 6 months (starting the day of your medical). So – you should delay your interview. How should I delay my interview? You could email KCC and ask them to delay until July/August, or delay response when they ask for your documents. Thank you very much BritSimon. If I went to USA on May 2019 after the my interview. Can I come to Sri Lanka in December of 2019 for my final research presentation? 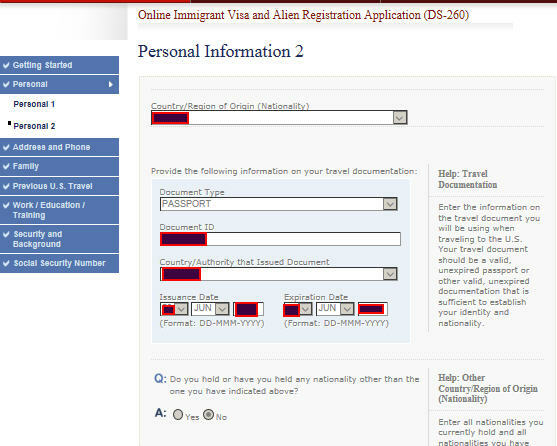 If I do Adjustment of Status instead of Consular processing, should I still send DS-260 form? I hope you’re doing well. I am from Kenya and my ref number is: 2019AF246*** it’s between 20,000 and 30,000. I have a question though. I made an error on the date and month of birth on the eDV and I also used the same dates for the DS260 which has already been submitted. Based on that reference number, when am I likely to be scheduled for an interview and I haven’t yet received any email from NVC. On the NVC website it says that I have compound submitted but it says that my application will be reviewed after all supporting documents have been submitted. Any idea on what to do? Well first you need to correct your mistake on the DS260. Do that now. We have submitted our DS 260 by the end of September. We are doing AOS. I am under F1 and my husband is under F2. 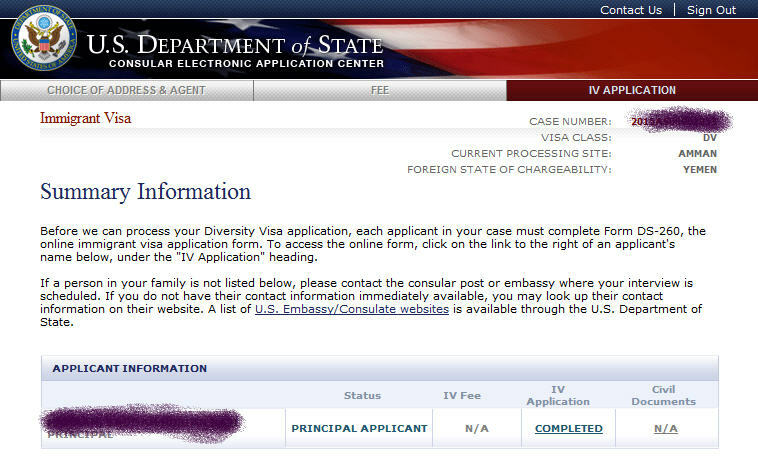 My husband has his visa on his old passport but I gave his new passport number when filling the DS 260. Would that be a problem ? I have’t heard anything from KCC yet. Do I need to let them know about this ? No problem. You are doing AOS so your DS260 is not important. You can discuss this in the interview – it’s trivial. Let’s say you have a girlfriend who got your baby after applying dv lottery can you marry her after results and update it on ds 260 as married with a child. hi Brit is high school a degree or a diploma ? I have bachelor degree but i don’t practice that profession since 6 years ago and they ask that you must have experience on that into last 5 years. Now i have my own small business since 6 years ago, i am the president, but i don’t study or made any course to have my small business, i opened it and that’s it. What should i fill in the ds260 ? the high school or the business occupation ? You detail education AND work experience. You have to use the “add applicant” functionality to create a DS260 for your spouse. Dear Brit, I am the principal applicant for the DV2019, and at the moment of filling the DS260 form l was single, and after a few months l got married to my boyfriend. l unlocked DS260 and changed my status to married. Added my spouse and, as it was indicated in form, his basic information / address, name, date of birth, education. l am confused with ds260 for him, is it the whole ds260 as it was mine? Thank you! 2. Send your documents in a few days. Thank you for all the useful information. I need to better understand the DS-260 and its purpose, especially with regards to the AoS process when already in the U.S. The company that I work for is paying for all the cost with regards to the process provided that I use their lawyers. Now… the lawyers has advised that there is no need to submit the DS-260 since that is for a consular process for selectees that reside outside of the U.S. A simple AoS is their recommendation with out submitting DS-260. I’ve read mixed reports on both – some saying it is not necessary to complete, other advising to get it done asap. I guess I’m looking for motivation on why I should submit DS-260. And if I don’t, do you know of cases that was successful without submitting (and visa versa)? Lawyers don’t understand DV cases. They do not realize the timelines that apply in DV or the steps that are taken. To be honest, based on the experience of many cases, you would probably be better off without a lawyer, unless you have some odd complication with your case. What they are missing is that filing the DS260 informs KCC that you will be filing AOS, and we have anecdotal evidence to show that this can be useful later in the case when the FO asks KCC for “the case file”. We believe it speeds up that response somewhat. So – technically, AOS cases don’t need a DS260, but there is usually no harm in filing it, and there is a potential gain in speed, so why not file it. Do yourself a favor. Click the link below and study the spreadsheet linked from the first post. You will at least know when your lawyer is about to screw something up. Thank you, Sir! All makes sense. Just out of interest (as this is the 1st time I’ve heard of this), when you say ‘the case file’, what does that entail? We don’t know the specifics of what is in the file, but it would presumably confirm your eligibility regarding your DV selection. I have never seen an AOS case be processed without the FO asking for the file from KCC. It is a step that sometimes causes delay right at the end of the process – and my advice is to (attempt to) reduce such delays. Is there any high impact to DV program or scheduling interviews case of us government shutdown immigration? If the longer the shutdown continues, is there any risk to 2019 dv lottery winners to not schedule the interviews? I think my previous answer covers that. have a challenge of signing and submit, shows a red arrow on the KCC case number. what will be the problem. One friend also says he might have miss typed his date of birth and now that can not get him to access DS260 what is the safe way of going about it to get the date of birth he might have entered by error. Sounds like you are entering the wrong number, but you have not been clear, so I don’t know how to help. Your friend needs to try all the dates it might be. You mentioned possible delay in interview scheduling if one didn’t submit ds260 immediately (or shortly) after being selected for further processing. How far down would that push the interview date to you knowledge? I sent the documents on 20th July, and complete radio silence since. I found out that I got selected in the middle of May. So a full 2 months delay. You are overthinking. The article above is quite old and the comments about DS260 processing were shortly after it had been introduced. Relax. Be patient. Hi Simon! In the form you’re saying to cover all the combinations of names in other names used. My native language is Russian, so in all the originals my names are in Cyrillic. I changed my surname in my childhood, so my previous surname is stated only in birth certificate, and certificate of change is also in Russian. So, previous surname exists everywhere only in Russian. Considering it was translated by the certified translator according to all transliteration rules, is it enough to specify only transliterated version in other names used, or should I place just a Cyrillic one as in originals, or its even better to cover both here? Thanks! All combinations of OTHER names. It’s clear. Hi Simon, so if I will cover my previous last name both in Cyrillic and Latin, but only last name, I need to duplicate my Latin first name together with Latin last name, and Cyrillic first name together with Cyrillic last name, am I correct? Sorry if my questions look stupid. Thanks! You need to decide for yourself. If in doubt, over prepare, or over document. Then, stop over thinking. I wanted to know if we should include a child above the age of 21 in our ds 260 form . i was single during the time of entry, and i got married prior to receiving 1nl….in my ds260 i’m adding my legal husband as i had written kcc and they said yes add him..now in my ds260, how can i add my husband’s last name to my name with no error? Your legal name has change (through marriage). So – add that to your form and make sure you list your maiden name where additional names can be added. I am filling form DS 260. The screen keeps freezing after imputing 5 or 6 addresses. Has anyone had this problem before? I changed browsers but problem is same. Is there a limit to the number of addresses that can be imputed? I have not heard that problem before. Do you mean you get locked out after 15 min and have to restart? Because that happened to me. Just try saving after each address, if possible. Hello Brit I need your help. I am a dv 2019 selectee when playing I included my spouse and my 3 children that are under 21 years old and now that I have won my wife and my last child will not immigrate with me .So I was asking when completing the ds260 I should complete the ds260 for every body even though as my wife and my last child will not go with me or I should I should complete for those who will go with me? Your own DS260 must list your wife and children. You only create DS260 for each person that is emigrating. 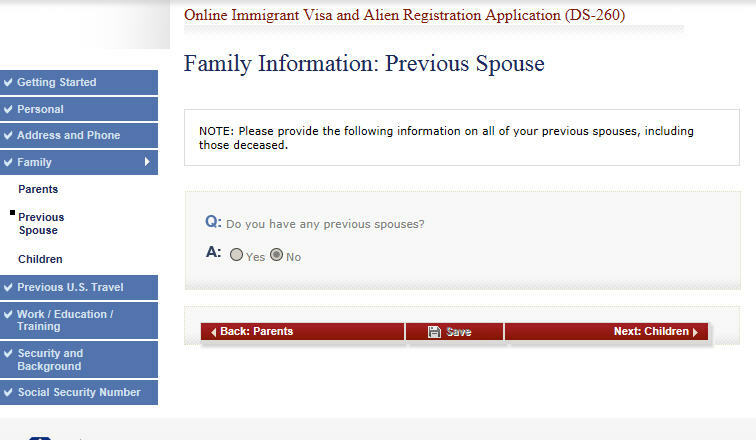 Your application can proceed without your family. Thank you Simon for the info. So based on this vb I am thinking to wait for sending the documents required as my case# is 2019AF23**** and still not received email for asking to send. Dear Simon shall I send the doc’s or keep waiting? Thank you Simon for your invaluable advice. Normal here in Ethiopia it might takes two weeks to get the police clearance, will send it beginning of March hoping that my case will be current in June and hence police clearance is still valid. I know this is a little bit repetitive and annoying question, but still hope you might not ignore to share your insight. 1. So, if documentation to be sent is generic to everybody why not they made it just like Ds260 that every body need to fill out with out email requesting to do so? 2. Is there a risk/ disobedience, sending documents without being asked – even if with in the range of VB to be current in the next 1 or 2 VB bulletin? 3. Do applicants have gotten a 2NL who sent documents with out being asked? 1. The change in documentation is in the instructions that everyone should have read. 2. No, because there are already instructions! Please, I have another question, as I have 4 children but among the 4 I only had 2 with my wife and when filling my ds where I was asked the number of children I put 4 children as I have four. And when filing the ds of my wife where they asked the number of children she has which number should we put 2 or 4 since I only had 2 children with my wife among the 4? 4. 2 are her step children. I don’t understand. Which number of children should I put on her ds 2 or 4? Hello Brit I have 7 children among them there are 3 who are above 21 and 4 who are less than 21 and that I included in my edv entry when playing the lottery. Now my question is when filling my ds the place they ask about the number of children should I put all the 7 children or just the 4 who are less than 21? You just read and answer the questions. If they ask how many children – the answer is 7. If they ask how many children under 21, anser 4. In some years the highest numbers don’t get an interview. I don’t know how high your number is, or what will be the final number this year, so you simply have to wait and see. Most probably my interview will schedule on next June and I hope to got to USA on August. If I came back to my country after two weeks. How long can I stay my country without cancelling my PR? Read the FAQ article about that exact topic. Thank you very much sir. I read the FAQ article related to my problem. 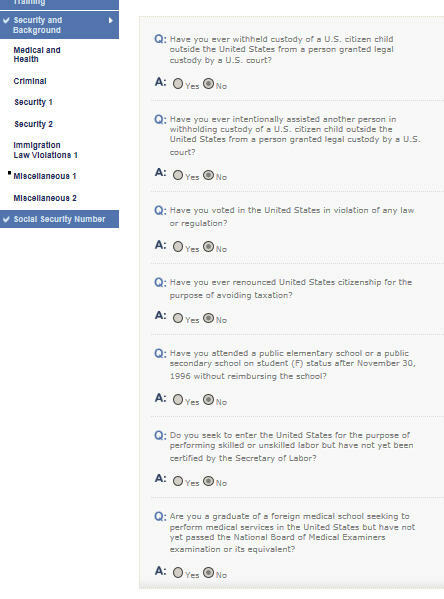 Is there any maximum total number of absences before apply for the citizenship? I have interview very soon. I have ticked “Yes” to question “Do you have any vaccination record in accordance to US law” thinking on will have in medical exam. Will it cause any problem in interview as i currently have no documentation? any idea or experience of interview regarding this issue. No problem. You will get needed vaccinations at the medical. I am winner of DV. My interview is next week in US. (where I reside past 15 years) do I need Medical Exam/Visa fees? if i mention my childs in edv but they will not travel with me… they will stay with there mother cause im divorced . 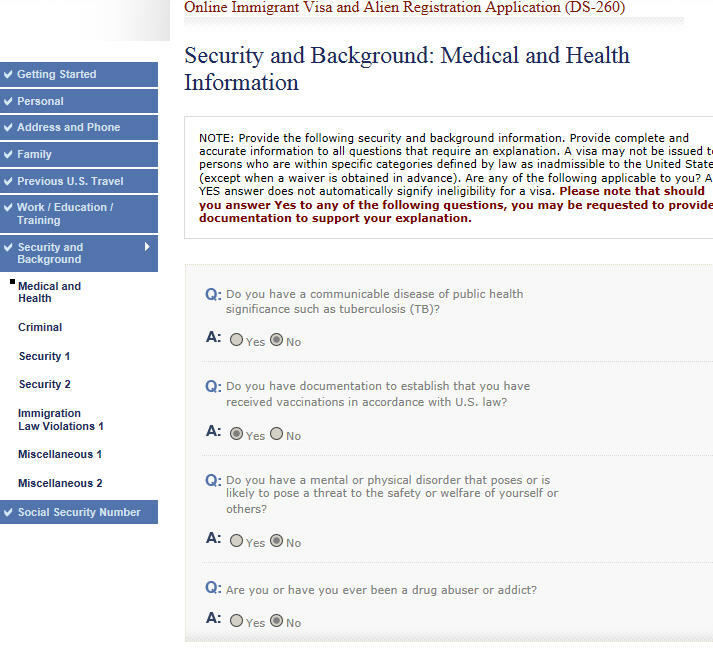 how i mention that I am not asking green card for them in the ds260 form . and do i need my child’s paper on the interview? You list the child in your DS260, but do not create a DS260 for the child. Hi Brit, my CN is 2019AF24*** when filling the DS260 I mentioned that my wife and children will travel with me and their own DS260 was filled also. But now I want to travel with my wife and my kids will join me later, what should I do now.thanks for your response. You need to decide how much later. Each person that gets approved has up to 6 months to enter the USA. So – the easiest thing is to stagger your entries over that time. Alternatively you would not take them to the interview. But later, once settled in the USA, you would start a sponsorship process to bring the kids, BUT that process takes 2 years and is more complicated & expensive compared to DV. Hi Brit, this is kindly to request you one confusion that I face while filling my D’s 260, on zip code address there is no zip code in Ethiopia, but mistakenly I filled my postal address. Should I unlock the form or is it a tribal mistake? Thank u very much waiting u response eagerly. No need to fix it. I am 2019EU22XXX and hoping that I will be current next week. I am in the USA under F1 and about to do AOS. I did submit my DS260 this week. By the question last 5 visits in the USA start date and end date, I put my last visit before I came under F1 since this visit of mine is still last. Did I make a mistake? For me it was obvious that this visit is still last and they know it since my US address was submitted in the dv lottery and the first question was on ds260 that they see i am in rhe US and if i adjust status or do cp. Yes. I have summited my all document and got document received mail too on feb 13. Is interview mail will come? Does sponsor require a PR or citizenship in USA? THat is best because there are no concerns of being there temporarily.